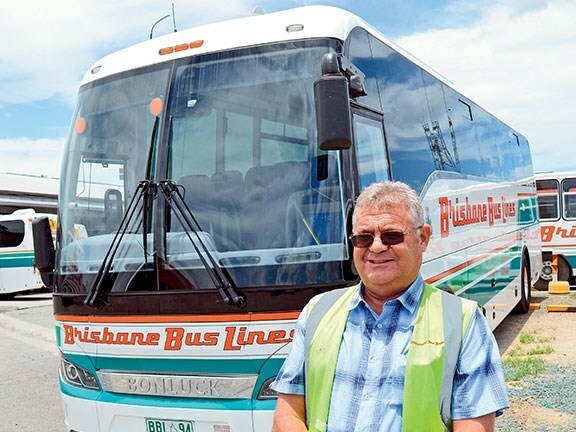 Despite having a large number of school contracts and a busy charter schedule, Brisbane Bus Lines (BBL) remains dedicated to the family values that founder William (Bill) Mitchell instilled early on. Managing director Ian Mitchell’s daughter, Lara Jane Mitchell, joined the family business in 2006, at first working on charter bookings and accounts before becoming a director in 2012. Ian’s son, James Mitchell, also works within the company as its fleet presentation manager and yard supervisor. The third sibling, Annaliese Mitchell, works as a civil engineer and is the only one of Ian’s children not working within the business at this stage. "We do predominately government-contracted school runs and chartered school runs for various private schools," Lara Jane says. "We also do a lot of charter work for various schools." BBL services a number of state schools in Brisbane’s inner north-western suburbs, drawing patronage from the Samford Valley, Dayboro and Ocean View areas. It also has established relationships with a number of government schools outside of Brisbane, in places like Dayboro, which is about 40km away from its depot at Enoggera. "We have long-running relationships with a number of schools including Dayboro State School and Samford State School," Ian says. Queensland Government school contracts have set terms of five years, after which time bus operators must engage in a tender process, with applications from a range of bus operators being considered. "We are recognised by the Queensland Government as a prime contractor for school services in our area," Ian explains. "One of the problems with the contracting system is you’re only ever contracting for five to seven years," Ian says. "Nothing is guaranteed and, in a way, that puts a limit on how much you can invest." The organisation also services a number of private schools and engages in charter services for them also. BBL also does a lot of rail replacement jobs for TransLink and it assisted in a major way when an alleged train driver shortage meant Queensland bus operators from far and wide were called upon to replace rail services late last year. 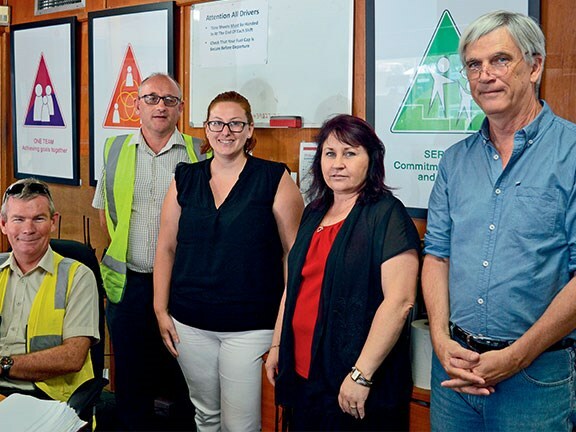 "It was really good to see our industry band together to help provide buses during the major closure to get the Redcliffe rail line hooked into the Sunshine Coast line," Lara Jane says. "This was where we worked closely with Kangaroo Bus Lines as they were the lead operator. "We have also been helping with the train driver shortages, but replacing services during the construction of the Redcliffe line was a large project where all the bus industry helped out. 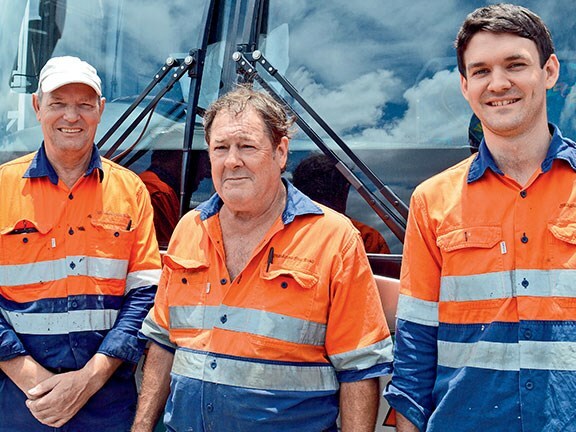 "There were a heap of bus operators that helped out at that time from all around Queensland – Maryborough, Bundaberg and Toowoomba. Kangaroo Bus Lines was the lead operator on that." "Bus operators are assisting Queensland Rail by providing rail replacement services several times every week," Ian adds. "What Queensland Rail has done is it has centralised rail replacement services so that just one bus operator is responsible for organising buses to replace rail services when a particular section of rail goes down. "If that operator needs assistance from other bus operators then they are responsible for organising that. "It makes sense because, that way, there’s no confusion in terms of who’s doing what from a logistical perspective. "Luckily we have a very good person in the office here that has been doing all this and coordinating rail replacement buses in Brisbane for the last 15 years, and there are very few scenarios that he hasn’t encountered in his time. "We assign buses to help out TransLink almost every day." The BBL depot is just a stone’s throw away from the Australian Army’s ‘Gallipoli’ Barracks. The bus operator’s relationship with the Defence Force has never been stronger than it is today. "We provide a lot of services for them and it’s a relationship that we value very much," Lara Jane says. "Army families have a very strong presence out here, and we look after them and do our best that community. The base facilities underwent a $770 million expansion in 2014. There are more than 5600 defence force personnel on site, making it one of the largest army bases in Australia. The BBL fleet now consists of about 85 vehicles: a healthy mix of full-size coaches, midi buses, and a number of minibuses to help cater for those smaller charter jobs. Some of the newer additions to the fleet include Bustech/Volvo combinations. Others in the fleet include 10 Autobus/Scania coaches, 10 BCI Classmasters (2009), and four 8.5m Cummins-powered BCI midi buses. BBL also has 10 Bonluck articulated buses, 10 Bonluck 12.5m buses, and about 10 Fuso Rosa minibuses. "We had an ageing fleet up until quite recently," Ian explains. "We have bought a lot of new buses over the last 10 years and thankfully we are more or less over that hump now." BBL employs about 50 full-time staff and between 60 and 80 casual staff members. The administrative side alone has a team of 15. There are also seven mechanics, one auto-electrician and one apprentice. The organisation even has three bus and coach body builders, and has its own panel beating workshop. "We do all our own repairs if we can and if it makes financial sense for us to do so," Lara Jane says. "Having our own body shop gives us a great advantage because we are not at the mercy of outsourced panel companies and waiting for our vehicles to come back into service when we need them. "It also ensures that our fleet stays looking good because we can do minor repair jobs whenever we need to. "It’s difficult getting your bus back on the road in time; if you have to rely on an external company to do your repairs, even if you try to avoid booking it in during their busy times during school holidays, that can become very frustrating. "That’s the main reason why we choose to do it ourselves now. "We have an auto electrician and a mechanic for air-conditioning maintenance. He does a good job and has a great team behind him. We have a team member of the month award and that’s just a way of letting people know that their hard work is not going unnoticed." Ian’s father, Bill Mitchell, started the business way back in 1944, just as World War II was ending and Australian troops were making their way home to Brisbane. "The first mention of him in government records that we have found so far  is an application to operate a parcel service from Brisbane via Ipswich and along the Brisbane Valley to Gayndah in the Burnett region. Bill would have been only 15 years old," Ian says. "His real start in transport was in Toowoomba operating a cream run. He then went into partnership with a bus and taxi company in Toowoomba around 1945 or 1946." Bill bought the (Mount) Tamborine Bus Service in the early 1950s and then moved to Brisbane and had a depot in Milton. Later he operated what was known as the Bulimba Gibson Island Bus Service. He started a company known as Charter Coaches in the early 1960s. Bill also ran route services connecting emerging residential areas on the outskirts of Brisbane – where people were starting to buy houses – with the more established inner suburbs where people worked. In 1963 he picked up three route service licenses: Samford to Brisbane, Boonah to Brisbane, and Dayboro via Petrie to Brisbane. In 1967, Bill sold Charter Coaches on vendor finance to Continental Coachlines in order to concentrate on his school/urban route services in Brisbane and around the Dayboro Area. Continental Coachlines went bust within the next two and a half years and Bill ended up with all the repossessed buses. He sold the Mount Tamborine service and started building the charter side of the business up once again. "Bill ended up with a whole lot of repossessed buses and obviously he needed something to do with all these buses and to put them to use, and the only way to do that quickly really was to start doing a lot more charter work," Ian explains. "The problem with Brisbane’s route services in the 1960s was a law was passed that allowed any council to come in and take over bus services in any area at any time, so there was no certainty for route service operators." Outside of Brisbane’s boundary, school services were always well populated because of the young families. Around the same time, in the mid-1970s, semi-rural land in the nearby suburb of Samford was starting to be sub-divided and new government schools started to pop up to accommodate the children of new residents. BBL picked up the majority of the school service contracts for these new schools, further bolstering the number of services it provided locally. It was in the late 1970s when Bill’s children started working within the bus company. "My older brother, Jeffrey Mitchell, joined the business as an apprentice mechanic, and I officially joined in the office in 1979," Ian says. "The old man always had an eye for second-hand buses, so that also kept us entertained." Tragedy struck the family when Bill died in 1984. "Dad died about two weeks after my wedding," Ian reveals. "We had, over time, four different depots that were all located in the suburb of Milton. We were still based at Milton at that time in our fourth and final depot in that area. "It was all really sudden, but Jeff and I became directors soon after dad passed away. "We had both worked in the company for quite a while at that stage so we knew what we were doing, but you’d have to say we were thrust into it pretty suddenly and unexpectedly. 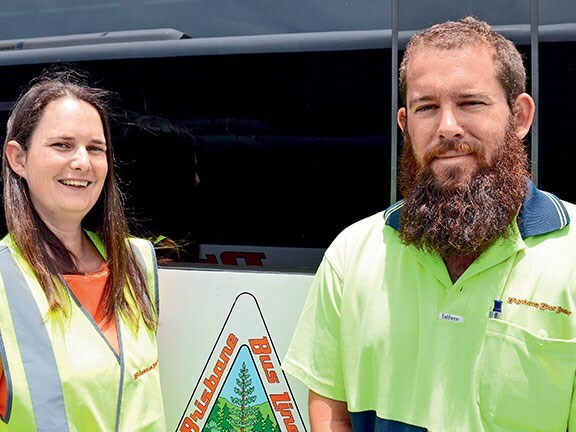 "It took six months for us to decide that we needed to move into a depot that was closer to our service area and that’s when we moved from Milton to Enoggera. "We moved in here in the January 1985 school holidays, so we’ve been here for the last 32 years," he says. "This site was perfect for us because it has previously been a depot for a sanitation company. As a result it already had everything we needed: fuel facilities, a workshop, a wash bay, and admin building. Everything we have now was basically already in place." "We are sitting on nearly four acres here, so we have plenty of room," Lara Jane says. "Things are starting to get a bit tighter now with the number of buses that we have but it has served us well. "We are eight kilometres from the CBD, close to the airport and all the major highways heading north and south, so it’s an ideal location." Ian and Jeff worked in partnership for 22 years until Jeff retired in 2006 and Ian bought out his share of the business. Nowadays, about 75 per cent of the company’s annual revenue comes from charter work and the rest is from the school contracts or contracted charter. "Charter is a hard slog," Lara Jane reveals. "It continues to be very competitive here in Brisbane." On the charter side, BBL’s long-running association with the Australian Defence Force is bearing fruit. "We do travel further for defence force jobs, but it certainly helps having them right on our doorstep. "We did charter tours for two American naval ships last year," Lara Jane says. "Those ships carry a lot of people, so that was a fairly big job and something out of the ordinary." 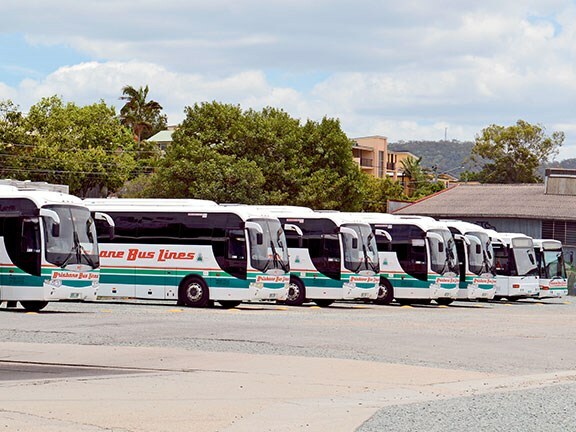 Despite the challenges it has faced over the years, Brisbane Bus Lines has remained rock solid, family –oriented and has adapted to changes in the industry time and time again.